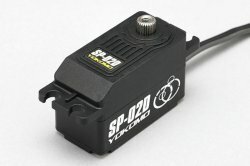 Introducing the all new next-generation digital servo, the SP-02D, exclusively designed for RWD drifting! Many RWD drift drivers may be experiencing hunting, steering shake, humming constantly and generating heat from not finding the center point with different levels of steering Gyro and servo combinations. In order to solve the problem, Yokomo..